Most of us associate Saint Patrick’s Day with green beer, leprechauns, pots of gold, shamrock’s, and a chance to let go and party. So here is a bit of information about this day that you may not have known. Saint Patrick is the patron saint of Ireland. He is credited with bringing Christianity to the Irish. He lived in the 5th century, which is like 16 centuries ago. The shamrock became part of the celebration, when it was said that Saint Patrick would use them to describe the Holy Trinity to children. Here are several infographics I found that share all kinds of awesome stuff about all things Irish and green. March 05, 2015 the smallest full moon of the year occurs. It is often called the micro-moon or mini-moon. As the temperature begins to warm and the ground begins to thaw, earthworms appear, heralding the return of the robins. This March full moon – smallest full moon of 2015 – lies about 50,000 kilometers (30,000 miles) farther away from Earth than will the year’s closest full moon – the full supermoon of September 28, the Northern Hemisphere’s Harvest Moon. The full moon on Thursday March 05, 2015 at 1:05 PM has many different names due to its signifying changing from winter to spring. Winter is retreating and spring time is on its way! It’s Time to Set Yourself Free from the Restraints of Winter and Swim to the Moon! Of course, the truest mark of spring doesn’t happen until next March 20, 2015. That’s the vernal equinox, the actual first day of the season. The east coast of the United States officially switches over around 1 p.m. The days will grow longer and warmer. 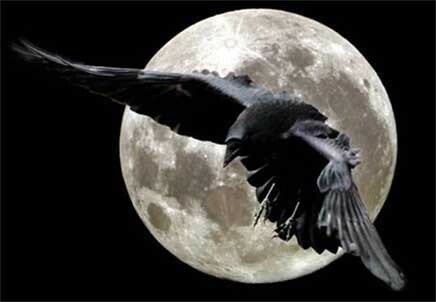 This full moon is also known as the Crow Moon or Magpie Moon. The Native American full moon names for March are largely based on these being considered the last full moons of winter; the crow caws its farewell to the season. The more northern tribes knew this Moon as the Full Crow Moon, when the cawing of crows signaled the end of winter; or the Full Crust Moon, because the snow cover becomes crusted from thawing by day and freezing at night. The Full Sap Moon, marking the time of tapping maple trees, is another variation. To the settlers, it was also known as the Lenten Moon, and was considered to be the last full Moon of winter. In Celtic tradition it is called Chaste Moon and Moon of Winds. In Native American Medicine the Crow represents: Justice, shape shifting, change, creativity, spiritual strength, energy, community sharing, and balance. To learn more about all the different Full Moons throughout the year Click Here. The full moon is a good time to do a releasing ceremony. Learn how to do this by watching my video. The full moon on March 16, 2014 has many different names due to its signifying changing from winter to spring. Winter is retreating and spring time is on its way! It’s Time to Set Yourself Free from the Restraints of Winter and Swim to the Moon! Of course, the truest mark of spring doesn’t happen until next Thursday, March 20. That’s the vernal equinox, the actual first day of the season. The east coast of the United States officially switches over around 1 p.m. The days will grow longer and warmer. Crow Moon or Magpie Moon. The Native American full moon names for March are largely based on these being considered the last full moons of winter; the crow caws its farewell to the season. The more northern tribes knew this Moon as the Full Crow Moon, when the cawing of crows signaled the end of winter; or the Full Crust Moon, because the snow cover becomes crusted from thawing by day and freezing at night. Full Worm Moon – As the temperature begins to warm and the ground begins to thaw, earthworm casts appear, heralding the return of the robins. The Full Sap Moon, marking the time of tapping maple trees, is another variation. Long ago, when Ireland was the land of Druids, there was a great Bishop, Patrick by name, who came to teach the word of God throughout the country. This St. Patrick—for he was indeed a saint—was well loved everywhere he went. One day, however, a group of his followers came to him and admitted that it was difficult for them to believe in the doctrine of the Holy Trinity. St. Patrick reflected a moment and then, stooping down, he plucked a leaf from the shamrock and held it before them, bidding them to behold the living example of the “Three-in-One.” St. Patrick used the shamrock to explain the concept of the Holy Trinity of the Father, the Son, and the Holy Spirit. The simple beauty of this explanation convinced these skeptics, and from that day the shamrock has been revered throughout Ireland. A four-leaf clover has always been considered a symbol of good luck in Irish culture. According to legend, the leaves of a four-leaf clover represent hope, faith, and love, and God added another leaf for luck. St. Patrick chose the shamrock from Ireland’s greenest land to teach of Father, Son and Spirit so that we could understand. May you be blessed with all God’s gifts on St. Patrick’s Day and always. The full moon in March has many different names due to its signifying changing from winter to spring. It’s Time to Set Yourself Free from the Restraints of Winter and Swim to the Moon!